I went up to St. Paul last Saturday for the annual Orchid Society of Minnesota Holiday Party, which was held at the Mai Village, an excellent Vietnamese restaurant. This was a lunch event, and I sat with Philip and his mother (click here for a link back to the Perry event and Philip, our youngest Orchid Society member and also an amorphophile), along with Karen Kleber-Diggs of the Como Conservatory, and other interesting lunch companions. Karen was my contact when we donated two plants of Amorphophallus titanum to Como a few years ago. After lunch, Philip and I proceeded to Como for the second part of the Orchid Society event: tours of various parts of the facility. After we had spent a good bit of time in one of the orchid greenhouses looking at plants and taking photos, we connected with Margaret Yeakel-Twum, also of Como, and keeper of the titanums. 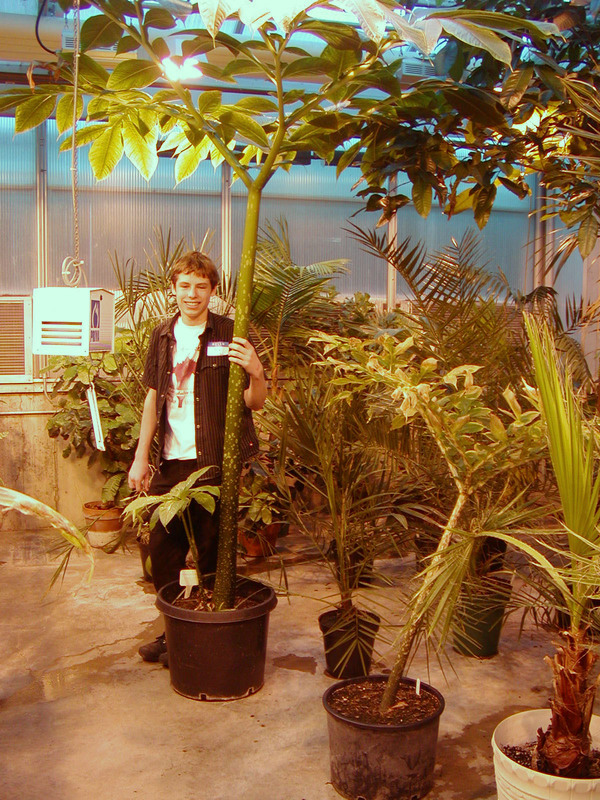 Margaret took us to a relatively small greenhouse where she keeps the titanums and other special plants :=). One of the two Como titanums had split into two corms – a 25-pounder and a 13-pounder. Margaret showed us the central shoot on each of them, and we took some photos (see below – the photographic composition of the first one is the strongest deja-vu-inducing item for me). The other plant was in leaf (see photo below). 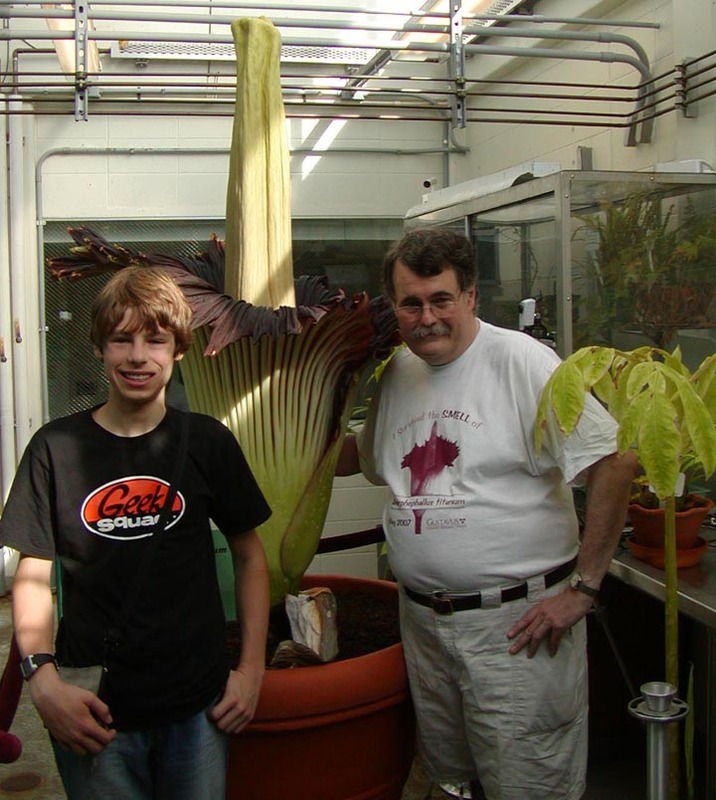 The 25-pounder is in a 44″ pot, so it should grow rapidly to produce a monstrously heavy corm. 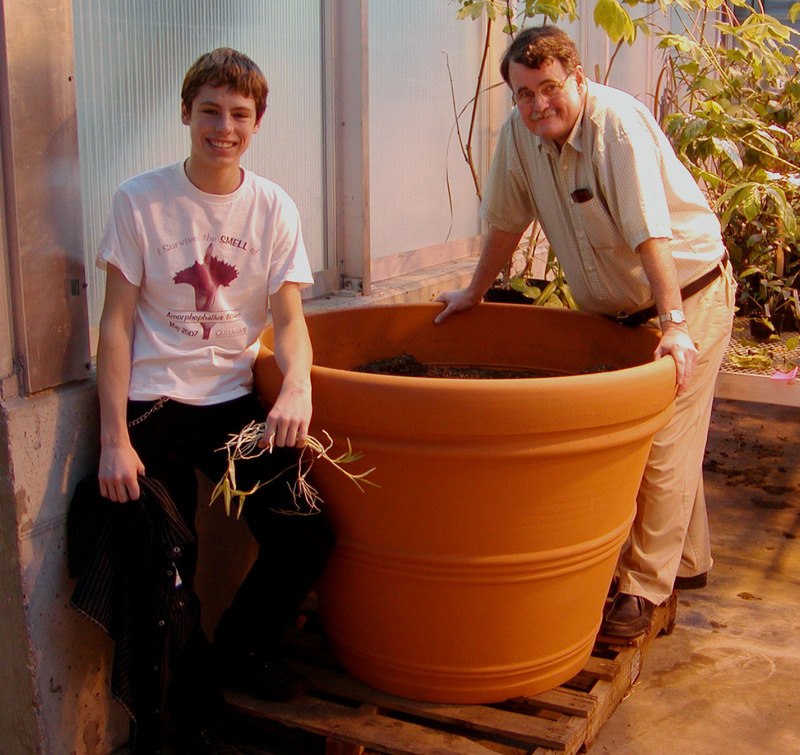 Our experience at Gustavus is that these plants tend to grow to fit the pot that they’re in, then keep going, nearly heave themselves out of the pot, and put extraordinary stresses on the pot. I’ll post more on the Como titanums soon, and will document their progress. I’ll also document Perry’s activity. We don’t know, at this point, how much longer Perry’s dormancy will last, but once we see that telling crack in the potting mix in the center of the pot, I assure all of the followers of Perry that you’ll be informed. The growth of Perry’s leaf should be both astounding and magnificent. Click here to see Perry via webcam.